Endocrine glands lack ducts and are hence, called ductless glands. Their secretions are called hormones. Hormones: Hormones are non-nutrient chemicals which act as intercellular messengers and are produced in trace amounts. Hypothalamus is the basal part of diencephalon, forebrain and it regulates a wide spectrum of body functions. It contains several groups of neurosecretory cells called nuclei which produce hormones. These hormones regulate the synthesis and secretion of pituitary hormones. However, the hormones produced by hypothalamus are of two types, the releasing hormones (which stimulate secretion of pituitary hormones) and the inhibiting hormones (which inhibit secretions of pituitary hormones). 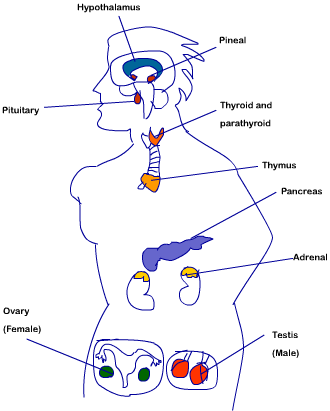 These hormones reach the pituitary gland through a portal circulatory system and regulate the functions of the anterior pituitary. The posterior pituitary is under the direct neural regulation of the hypothalamus. The pituitary gland is located in a bony cavity called sella tursica and is attached to hypothalamus by a stalk. It is divided anatomically into an adenohypophysis and a neurohypophysis. Adenohypophysis consists of two portions, pars distalis and pars intermedia. Growth Hormone (GH): Over-secretion of GH stimulates abnormal growth of the body leading to gigantism and low secretion of GH results in stunted growth resulting in pituitary dwarfism. Prolactin (PRL): Prolactin regulates the growth of the mammary glands and formation of milk in them. Thyroid Stimulating Hormone (TSH): TSH stimulates the synthesis and secretion of thyroid hormones from the thyroid gland. Adrenocorticotrophic Hormone (ACTH): ACTH stimulates the synthesis and secretion of steroid hormones called glucocorticoids from the adrenal cortex. Luteinizing Hormone (LH): LH and FSH stimulate gonadal activity and hence are called gonadotrophins. In males, LH stimulates the synthesis and secretion of hormones called androgens from testis. In females, LH induces ovulation of fully mature follicles (graafian follicles) and maintains the corpus luteum, formed from the remnants of the graafian follicles after ovulation. Follicle Stimulating Hormone (FSH): In males, FSH and androgens regulate spermatogenesis. FSH stimulates growth and development of the ovarian follicles in females. MSH acts on the melanocytes (melanin containing cells) and regulates pigmentation of the skin. Pars intermedia secretes only one hormone called melanocyte stimulating hormone (MSH). However, in humans, the pars intermedia is almost merged with pars distalis. Neurohypophysis (pars nervosa) also known as posterior pituitary, stores and releases two hormones called oxytocin and vasopressin, which are actually synthesised by the hypothalamus and are transported axonally to neurohypophysis. Oxytocin acts on the smooth muscles of our body and stimulates their contraction. In females, it stimulates a vigorous contraction of uterus at the time of child birth, and milk ejection from the mammary gland. Vasopressin acts mainly at the kidney and stimulates resorption of water and electrolytes by the distal tubules and thereby reduces loss of water through urine (diuresis). Hence, it is also called as anti-diuretic hormone (ADH). The pineal gland is located on the dorsal side of forebrain. Pineal secretes a hormone called melatonin. Melatonin plays a very important role in the regulation of a 24-hour (diurnal) rhythm of our body. For example, it helps in maintaining the normal rhythms of sleep-wake cycle, body temperature. In addition, melatonin also influences metabolism, pigmentation, the menstrual cycle as well as our defense capability.